Today we publish a series of questions and answers with Magnus Carlsen conducted on Reddit AMA (Ask Me Anything). You will learn many interesting details about world’s number one chess player and chess champion such as online playing habits, professional opinion about the Candidates Tournament and, most importantly, what made him “the strongest man”. With the FIDE Candidates tournament going on – where my next World Championship competitor will be decided – and the launch of myPlay Magnus app, it is good timing to jump online and answer some questions from the Reddit community. Excited for a round of questions about, well, anything! I’ll be answering your questiokrans live from Oslo, starting at 10 AM Eastern time / 3 PM Central European Time. My Proof: * I posted a short video on my YouTube channel, updated my official Facebook Account, updated my official Twitter Account. Edit: This has been fun, thanks everyone! Note: Original sentence structure is preserved. Q. Do you ever log onto sites like Chess.com, as an anonymous player, and just crush people for fun? Q. Follow up question; when playing on Chess.com, do you ever run into a particularly tough opponent and run into a particularly tough opponent and think to yourself “I must have at least heard of him” because there are so few people that have even a chance to win against you? Q. Hi Magnus! Even though you were International Master and Grandmaster early on, did you ever feel like you have plateaued with your game, that you did not think you could get better, or did you always know that you could be the best player ever? And if you did think you could not get better, how did you get better? MC. Times when I was struggling, I always kept a very positive mindset. I thought that things would turnaround in the next game, or the next tournament. Eventually it did. As for plateaued, I still feel that I have plenty to learn. It’s just about translating more knowledge into better play and better results. Q. What is your favorite chess game of all time? Q. When you play a game, how many variations are you going over in your head? How many moves out do you usually visualize? What’s the biggest blunder you’ve made since reaching GM status? When you look at a chess board, are you thinking about individual pieces or the whole board? Is it anything like a speed reader, who sees “the whole page” rather than reading word by word? MC. I usually consider from 1 -3 different moves and then the variations can be either fairly short or 15 – 20 moves if necessary. Blunder: it’s hard to say I’ve blundered Queens, rooks, minor pieces and pawns and check mates. Take your pick. I see the whole “page”. Q. Do you ever struggle playing yourself age 23 in the Play Magnus app? I personally pride myself in beating you at 8 years old. MC. I always struggle playing against Magnus 23. When playing younger “Magnuses” I’m occasionally successful. Q. Magnus, What was your most memorable/important victory and what was your most memorable defeat. MC. My most memorable victory was in the Norwegian Championship Under 11, when I was 9 years old. Defeat: perhaps my loss to Ivanchuk in the Candidates last year, although fortunately that story had a happy ending. Q. Hey Magnus. Do you see yourself making live commentaries on your YouTube channel? For example, you play a game of blitz chess while commentating why you do this and that. MC. I will definitely consider doing that. Q. If you could play any historic chess player in their prime, who would it be? MC. There are many options, but the first that comes to mind is Kasparov & Fischer, as well as Capablanca. Q. How many beers would you need to drink for a Master to be able to beat you? MC. There is no answer to this question… even extremely intoxicated my chess strength and knowledge is still in my bones. Q. What’s the biggest problem facing the world of competitive chess right now? MC. There are some good things happening right now, but I think there can be improvement in presenting the game so that it can reach a broader audience, draw more sponsors and thus have a more stable tournament cycle. Q. How good were you in general classes in school. Like math, sciences, etc. I’m wondering if genius in chess translates to exceptional performance in all academics. MC. I think to be successful in anything, at least for me, you need to focus and spend time to get knowledge and understanding of different subjects. When I did that in school, I did very well. When I spent more time on chess than on school, I did less well. Q. I noticed on your Twitter account that you are closely following the 2014 Candidates tournament. Are there any games or positions that have struck you as particularly interesting or beautiful? MC. I was impressed by Anand’s win against Aronian in the first round. It’s not often that you beat the number 2 player in the world purely by technique. Q. What do you think made you the strongest man in the world? Q. Hi! What do you think of Nakamura joking with calling you Sauron on Twitter? MC. I’ve never actually watched Lord of the Rings… if I had, and Nakamura had been a better chess player, I might have been more insulted. Q. Hi Magnus! I’m a fan from Pakistan. We all know you as a child prodigy. What I wanted to know is whether you had a clear understanding of chess principles, openings and defenses as a child or did the game just naturally make sense to you and you winged it? MC. My coach Peter Heine told me that he saw me play as a ten year-old, and gained the impression of someone who knew a lot of theory but couldn’t play that well on his own. So, it has been a long process and gradually I have learned more and more about the game. Q. I’ve always wondered; now that you are the best in the world. How can coaches help you get better? Or don’t they at all? Is it just up to yourself now to improve? Q. Do you think you will be able to break the 2900 barrier in the next few years? MC. If I keep up my level and improving, I think I have a good chance. It’s not a goal in itself, if I play well, it happens. Q. What do you think you’d be doing if you never got into chess? Q. Time Controls are a big debate in the chess world. If it were up to you, would you make chess more spectator-friendly by reducing time controls or would you keep them where they are at the moment? MC. I think the currently classical time control is a good one, it gives plenty of time to think and come up with good ideas, while still keeping the excitement for viewers. Q. I’m trying to break the 2000 barrier and I was wondering if you could give me any advice to achieve my goal. Q. Is perfect chess a draw or win for white? What do you think? MC. I don’t know, but I am very much leaning towards a draw. Q. What’s your favorite chess book? Favorite non-chess book? MC. Chess book: Kramnik: My Life & Games made a strong impression on my as a child. Non-chess book: close race between several Donald Duck comics (seriously). Q. Will you ever play against the houdini engine? And do you think you would be able to beat it? MC. No, and no. I only play against Magnus 23. Q. How has your life changed since winning the World Championship? Has it become more difficult to stay motivated? MC. My approach to tournaments has not changed that much, even before the World Championship I was the best player in the world, so in that sense it’s the same and I am the one to beat. I have the confidence that I can always do well. Q. Most amazing chess players and GMs that you hear about all started at a very young age, and were often very talented at that age. How much of an impact do you think starting at a young age has? Do you think it’s possible to become a master after having started later in life? Is it so rare? MC. I think in order to be one of the best in the world, you need to start early on and have a passion and great drive to learn more. In order to become a Master or an International Master, I think you can start later and it’s more about putting in the time and hard work rather than talent. Q. There’s a pretty large age gap between you and the 2014 Candidates participants Do you think that’s to your advantage? Also of the younger Grandmasters who do you see as a future threat to the World title? MC. I think players like Anand, Kramnik, Topalov and Svidler are part of a very strong generation of players, so it’s kind of natural that they’re still sticking around. To the second question: I think it is very early to say who will be a future threat, it’s really hard to see those traits before players are fully developed. Q. What is your favorite meal, and what do you eat before a match? MC. I don’t have a favorite meal, but before the match I would usually eat an omelette or a some yogurt with fruit. Q. What makes a good second and why did you pick the ones you did? Q. Are there any other games you’re particularly good at? Strategy games? What is your response to the general idea that you are too much of a grinder? A great many number of people have said that you specialize in squeezing out dry positions rather than playing attacking chess. Many GMs have called your style of chess as its death in some aspects. MC. No, it didn’t have anything to do with Anand, I’m very impressed by his level of preparation and general play both tactically and technically so far in the Candidates. I think it’s an important trait of a good player to be able to have the same level of focus and creativity in simple positions as well as more complicated ones and thus create chances at any point in the game. I don’t think making few mistakes and playing very accurately for a long time should be a negative. Q. What is your motivation to keep playing chess? Personally I play it for fun and get bored as soon as I play frequently. Do you just love the game or is it the winning instinct that keeps you going? MC. A bit of both. But most of all I want to learn and improve. Q. Hey Magnus do have any other plans or goals you want to achieve? You’ve conquered chess, what next? MC. I don’t think I’ve conquered chess yet. I still have very much to learn and there is much room for improvement, so I think I’ll stick to that for a while. 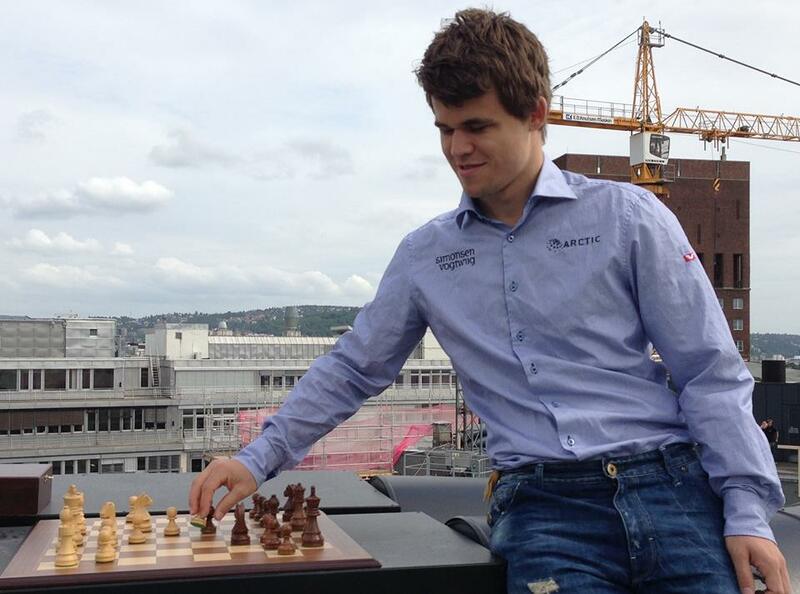 Magnus Carlsen’s facebook page, Reddit AMA. Ilya Maizelis co-authored the book, “Pawn endings” with Yuri Averbakh. Much of the knowledge in this work has been assimilated and refined in later books by others. Here is a short list of Batsford chess books. “Chess for Tigers” is a fun way of understanding the game. Avni’s work is useful for understanding tactics. The books on Lasker, Alekhine, Najdorf, Petrosian and Miles are good collections of games. Your other queries would be replied to separately. what do you think about chess books? what is the strongest one? what do you think about maizlis and batsford?